A Simple Flowchart to Help You Through The Maze! Gold Prospecting Regulations can be bewildering so Udo and I have put together this flowchart which may help you through the maze when you are attempting your first gold prospecting or metal detecting trip. The flowchart gives you an overview of the process to help you find gold without breaking the law. Below the flowchart is each of the headings with further information and links that you can use if you need to find out further information. If you want a more readable copy of the Gold Prospecting Trip Flowchart just left click the link and print out the expanded version. If you want a PDF copy of the flowchart with clickable links download it here Gold Prospecting Regulations Flowchart. After you have opened the flowchart either save it to your PC or Print it out for your own use. Who Owns the Gold I Find? Can I Prospect for Gold On The Land Selected? This is the first thing you must do and here is the link that explains how to get your WA Miners Right. Without a WA Miners Right you are breaking the gold prospecting regulations - it's cheap so just go get one. This is obvious I guess, maybe you have heard about a spot or researched places to go Metal Detecting or possibly just coming to WA on spec to find a bit of gold! Once you work out where you want to go gold prospecting and metal detecting you can use Tengraph Online to find out the details about the area you want to go. This is explained on the page and training relating to Tengraph Online Simple Graphical Training Help. Gold Ownership and Land ownership are two entirely different things and shouldn't be confused. Minerals such as Gold, Silver and Precious metals are the property of the Crown. Not the person who owns the land. If your gold find is on Crown Land not covered by a mining tenement then the gold is yours to keep. If your gold find is on a mining tenement where you have permission to prospect for gold then what you find will be subject to your agreement with the tenement holder. If the find is on Private Land that you have permission to enter and prospect on and not covered by a mining tenement then the gold is also yours to keep. Here's a link to Gold Prospecting Regulations - Private Land Provisions Pamphlet. 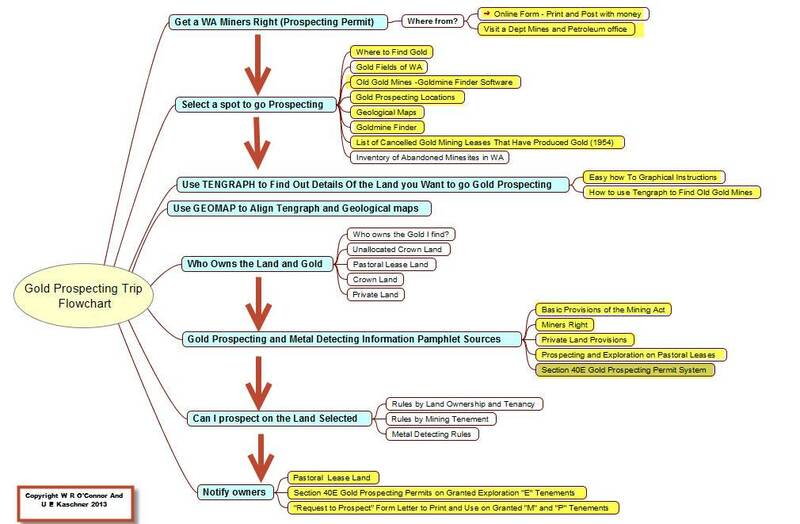 "Simplified Chart To Help You Quickly Understand the Rules for Different Types of Land Ownership"
Here is a simplified chart of Gold Prospecting and Metal Detecting Rules that helps you quickly see the rules for different types land ownership covered by Mining, Prospecting or Exploration permits. Make sure you link to the Department of Mines and Petroleum and download the pamphlets below which will give you more detailed information about gold prospecting regulations. We have only briefly outlined the gold prospecting regulations here to help you understand them. Here's a link to a Gold Prospecting and Metal Detecting Rules Simplified Chart that will show you what land you can prospect for gold on based on land tenancy and mining lease type. In our opinion this is a matter of common sense and courtesy but there are requirements outlined for notification of pastoral leases. These are explained more fully in the material from the Department of Mines and Petroleum including the excellent pamphlet Prospecting in WA - Your Rights and Obligations while Prospecting and Prospecting and Exploration on Pastoral Leases. - Pass and repass over that land in order to gain access to other land for the purpose of prospecting, provided the prospector complies with the additional requirements set out under the Act. While permission to prospect on Crown land is not generally required you should take all reasonable and practical steps to give the pastoralist prior notification in order to ascertain whether your presence will interfere with the pastoralist's activities. Exception occurs should you wish to prospect close to specified areas that are listed under the Act, including watering holes, dwellings and cultivated lands. In these cases, consent is required and for your own protection this should be in writing. Further information on prospecting on pastoral leases and other occupied Crown land can be obtained from Information Pamphlet No 5, Prospecting, exploration, mining on pastoral leases. If in doubt you should make enquiries with the nearest Mining Registrar's Office. These offices can also provide you with the contact details of pastoralists, upon request"
When you apply for a Section 40E Gold Prospecting Permit a copy of the permit is provided with the address of the pastoral leaseholder included. You need to send a copy of the permit to the pastoral leaseholder which is a condition of the Section 40E approval. After you have completed prospecting you also need to provide an "Advice of Minerals Recovered within Section 40E Permit Area" to the Dept of Mines and Petroleum and the holder of the exploration licence. Remember, that if you are ever stuck, just download the "How To" Use Tengraph EBook. The written section about Section 40E Permits starts on page 39. It will guide you through the process step by step. Sometimes it's better just to go direct to the holder of a lease or Private Property Owner to ask permission to prospect. Download some free letters that you can use at this page Request Permission to Metal Detect.